Upper Low Spawns Strong Thunderstorms. MEI Drops to Number One. SSTs Continue to Cool. MJO Enhances Typhoon Activity and May Increase West Coast Rainfall. 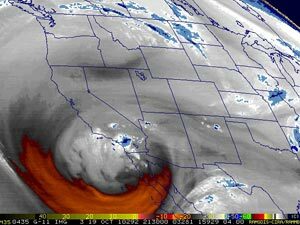 October 19, 2010 at 2:30 p.m.
Sunday evening through Wednesday afternoon, another energetic cutoff upper level low spun showers and thunderstorms into Southern California, increasing water year rainfall totals for many stations to near or above normal. Precipitation amounts varied widely, with some stations recording a few hundredths of an inch or less, and some as much as an inch or more. As was the case with the upper low at the end of September, this system produced a number of strong thunderstorms. A severe thunderstorm warning was issued as a result of a cluster of strong thunderstorms in the Antelope Valley Tuesday evening. Downtown Los Angeles (USC) was one of those stations that didn't have its rain bucket in the right place. The station recorded only 0.08 inch from Sunday evening to Wednesday afternoon, bringing its water year rainfall total to 0.51 inch, which is about 0.16 below normal. Here is an archived Public Information Statement (PDF) from the NWS with some rainfall totals from around the area. The Aug/Sep value of the Multivariate ENSO Index (MEI), released October 6, dropped another 0.18 sigma to -1.99. This is the lowest value of the MEI since Jul/Aug of 1955, and ranks the current La Nina as the strongest in the MEI record for the Aug/Sep season. Equatorial SST have continued to cool, and this plot of 5-day TAO/TRITON SST shows anomalies of -2.0°C or greater extending west to nearly the dateline. Cooling of SSTs in the Central Pacific appears to have been enhanced by strong 850mb easterly winds associated with an MJO which propagated into the Western Pacific over the past 2 weeks and slowly diminished in amplitude. Divergence aloft associated with the MJO appears to have enhanced typhoon and tropical storm development in the Indian Ocean and Western Pacific. 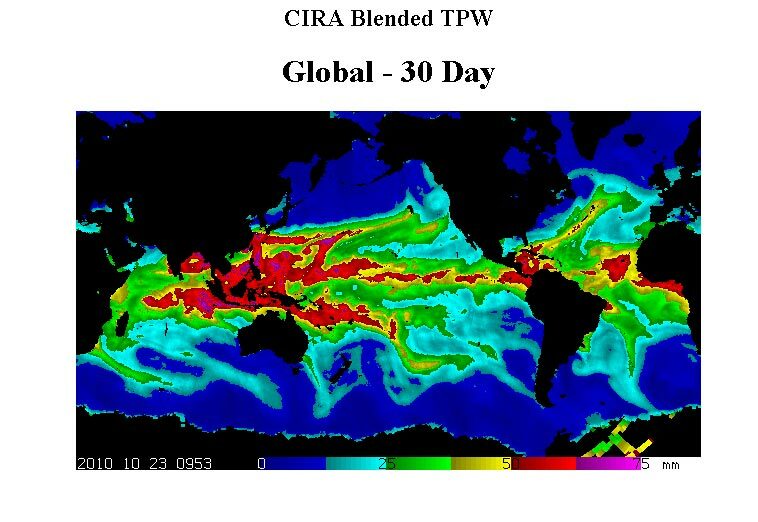 CIRA TPW loops show a lot of tropical moisture being injected into an extending Pacific jet. This could amplify rainfall amounts along the west coast of the U.S. the next few days. There's been some drizzle and light rain in the Los Angeles area this morning. BUFKIT analysis of 12z NAM data for Van Nuys and LAX generates about 0.1 inch of rain late Sunday afternoon and evening. 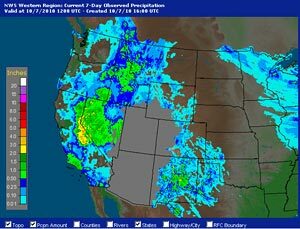 The bulk of the precipitation is forecast to occur in the northern two-thirds of California and into the Pacific Northwest. We'll see! Record Temperature in Los Angeles Followed by Record Rainfall. Just a week after Downtown Los Angeles (USC) set a new all time temperature record of 113°F, an unseasonably strong cutoff upper level low set up shop over Southern California, cooling temperatures and producing record rainfall over much of the area. Precipitation was recorded in many locations Monday and Tuesday, but Wednesday was the record setting day. According to the NWS Los Angeles/Oxnard, rainfall records for the date were set at numerous locations. Downtown Los Angeles (USC) recorded 0.30 inch, breaking the record of 0.22 inch back in 1916. Just a few miles away, LAX recorded 0.62 inch, smashing the old record of 0.16 set in 1945. Here's a preliminary record report (PDF) from the NWS. Cumulative rainfall totals recorded over the three days varied widely, ranging from 0.10 inch in Lancaster to over 2.0 inches at some locations in Ventura county. 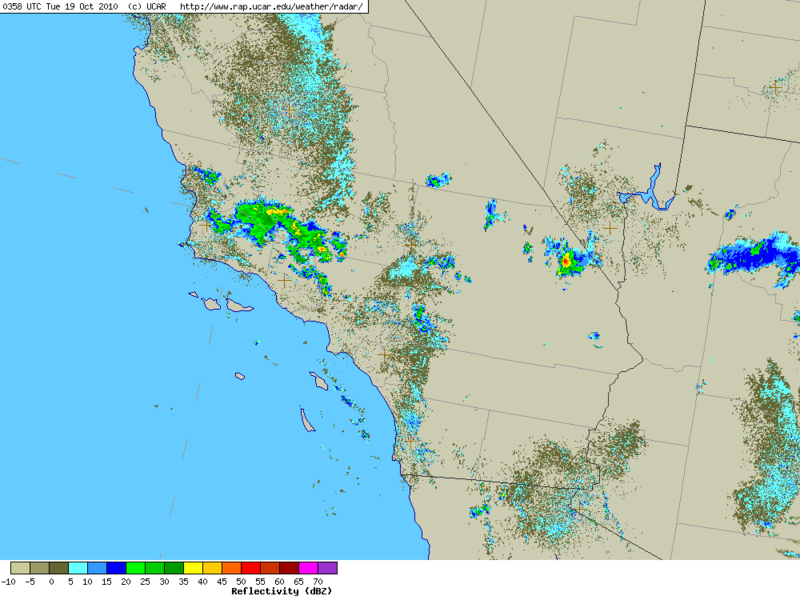 Downtown Los Angeles (USC) recorded 0.40 inch for the storm. This is slightly above the October monthly norm, but because July, August and September had no measurable rain, Los Angeles remains 0.12 inch below normal for the water year. Here is a Public Information Statement (PDF) from the NWS with some rainfall totals from around the area. The 12z NAM and GFS show temperatures rebounding quickly, with highs reaching the 80's and 90's across much of Southern California by Sunday. Next week the GFS projects a gradual cooling trend. We'll see!